The Energy Efficiency Advisory Panel is comprised of individuals representing a variety of stakeholders. Energy efficiency engagement sessions gave Albertans and technical experts an opportunity to provide their ideas to the Panel. 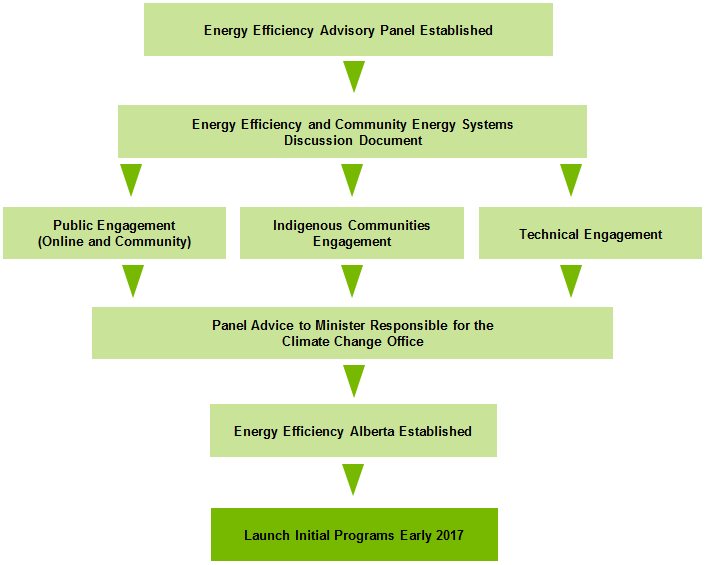 The Energy Efficiency Advisory Panel was created to make recommendations on the types of energy savings programs that Energy Efficiency Alberta can start to deliver in the short and medium-term, as well as help set out a long-term vision. Energy Efficiency Alberta is a new provincial agency that will promote and support energy efficiency and community energy systems (including micro-generation and small-scale generation) for homes, businesses and communities. The panel's final report was produced following engagement with the public, Indigenous communities, non-profit organizations and municipal and technical stakeholders in 2016. The panel also reviewed energy efficiency and community energy efforts of other jurisdictions including other provincial and territorial governments. The panel's advice will enable energy efficiency programs to launch in early 2017 - programs to help Albertans reduce greenhouse gas emissions and save money. The engagement process focused on overall objectives and programs for energy efficiency and community energy systems, including initial education, outreach and financial incentive programs. Alberta's Climate Change Advisory Panel, chaired by Dr. Andrew Leach, provided recommendations to government in November 2015, which informed the Alberta government’s Climate Leadership Plan. In its report, the Climate Change Advisory Panel highlighted energy efficiency and community energy systems as important complementary policy to the economy-wide price on carbon. Energy efficiency and community energy systems were identified as a means for all Albertans to help contribute to reducing greenhouse gas emissions, and to empower citizens, small businesses and communities to reduce their energy use and associated energy costs. "By fostering energy efficiency and energy resilient communities, Alberta has an opportunity to achieve significant emission reductions, to empower action by individual citizens, small business and communities, and to support the implementation of community energy plans." The Panel also highlighted the benefits of reducing energy demand in the province, such as avoided costs of energy builds and reducing air pollution. The Climate Change Advisory Panel recommended that “Alberta’s new climate change strategy should ensure we look at (energy efficiency) as an opportunity for enhanced prosperity and well-being." The Panel heard strong support for micro-scale generation as well as a new class of community-scale generation, noting that any new policies would depend on careful assessment of criteria, eligible technologies, impacts on the stability of the grid and conditions for market integration.